This page was added on 07/01/2011. The laundrette and barbers have always been there as has the fish & chip shop. The original window display fridge that had fresh fish laid out is still there! Wednesday night was the kids disco in the main hall of the community centre in the 70’s. We used to get bread crates from the back of Internationals and slide down the corner of the slope by the woods (Verity Way/ Vardon Road) underpass. After Fine Fare the shop turned into ‘Shoppers Paradise’, which as you mentioned was, basically a blueprint for Lidl and Aldi. Do you remember all the goods were sold out of the boxes they arrived in and the shelves and racking were all made of 2×3 and plywood and they looked like they’d just been hammered together out the back…. I use to be the head paper boy at the Red Shop until I joined the army and my mum worked in the post office part. Later on drank in the Pub, think it was called Pin Green? What a lot of people don’t know is we lived next door to a guy called Ray Kennedy, who worked on the recordings of the Beatles albums first in Liverpool and then at Abbey Road, studio 2. We lived at Webb Rise. Can any one remember the name of the food supermarket that was at the oval in the late 70 80 all there goods were in yellow packaging and you shopped out of boxes from the shelves. Early discount supermarket. The butcher’s is still there (but different name) and it stocks good quality meat. The hardware is still there, and has a great stock. Sadly the launderette has just closed down and very often when one of the shops closes down, a takeaway takes over, as is the case with an empty shop on the same side as the butcher’s; an application’s been made for an Indian takeaway. I came to live in Jessop road in 1975 btw. The three little boys in the striped tops are our sons. They were, from left to right, John aged four, Matthew aged three and Paul aged two. They were often mistaken for triplets! 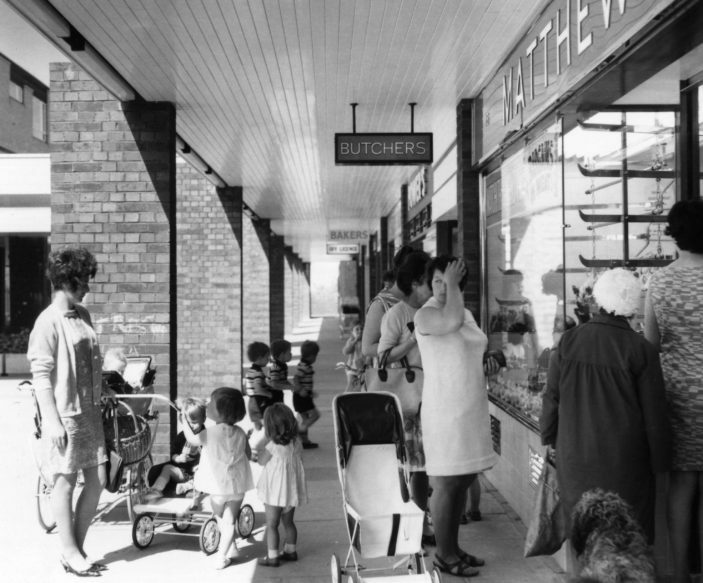 At that time (1969) we lived in Archer road and would often go to to the Oval shops. can anyone remember the young lad who used to work in the food shop in the 60s he used to do the meat at the back of the shop i used to say when i was little i was going to get married to him lol oh why cant Stevenage be like it was back in them days mums used to leave their babies out the front of the shop and they was fine wouldnt leave my grandson outside a shop these days yes happy happy days ! i used to live in Jessop Road when i was little i remember my nan giving me a pound for sweets but the lady in the sweet shop in the Oval wouldnt let me spend it all saying it was to much money to spend on sweets lol i was really upset and moaned at my dad who said i shouldnt of taken that much from nan in the first place when i was late teens my sister and myself used to go to the jumble sale in the church then we go in to the cake shop and go to her house in the 3 store houses just past the bridge from the Oval to have the most wonderful cakes ever with cuppa happy days !!!!!! Hi we have lived in Stevenage since 1956 and St Nicholas for over 30 years. The bakers at the oval was Pearces. The only remaining original shops I think are butchers and chemist maybe the hardware store. Nothing the Internet can teach us Phil – I remember when I was young my Mum used to write the order out in a little Red book and we would walk to the top of town with it ( that was another town – didn’t move to Stevenage until 1959) and hey presto the van delivered it next day only difference now is that we dont get the walk with Mum. Hi I was only young when they had the shop, I used to help do the deliveries on a Friday after school, I would just sit in the back push the boxes down to the back door of the van on each stop. Then when I was a bit older I was allowed to take the not so heavy ones to the customer. All this internet stuff – rubbish, you just called the shop put your order in and we delivered to your door. Hi, I remember Tony who ran the shop. The Oval is in Pin Green btw. My friend used to work there on a Saturday, Tracey Perkins. Haven’t seen her for years now. Hi you may remember my father. He owned the green grocers there, Tony and my mother help out Sylvia. Hey Michael, we lived next door to you from 1973-9! Well spotted, Mr Mayor, that the photo was wrongly captioned. The correct date was indeed 1969! No Oval in 1965. We moved to Trumper Road when it was brand new in Feb 1968. The Oval shops were not built until about a year later.